One of the many joys of using a fine fountain pen is availability in the wide assortment of bottled ink to choose from. Whether conservative or flamboyant, there is an ink to fit every personality and your every mood. You can always dip a pen for inking, but using a pen converter provides a longer lasting ink reserve and allows your ideas to flow. Some may be a little leery of exploring using a fountain pen converter. Here are some detailed easy instructions to take out the mystery of converters. 1.) Unscrew the neck from the pen barrel and insert the open end of the converter. 2.) Dip the pen in ink up to the hole in the nib. Be careful not to jam the nib point into the bottom of the bottle. 3.) Twist the black converter screw top clockwise three or four times to fill the ink reservoir. 4.) Ink remaining on the neck or nib should be wiped off with a clean tissue or cloth before use. You are now ready to write! 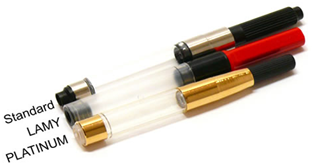 Question: When was the first pen reservoir invented? Answer: As an answer to 10th century ruler Fatomid Caliph of Egypt demand for a pen which would not stain his hands or clothes, a pen which held ink in a reservoir and delivered it to the nib in was created in 953.